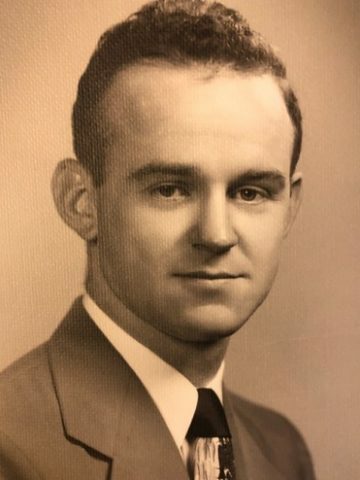 Samuel Wallace “Red” McClary – Age 90, passed away February 10, 2019 in Nashville, TN. Mr. McClary is preceded in death by his son, Samuel Arthur McClary and his parents William Franklin McClary and Pauline Irwin McClary. Survived by his loving wife of 70 years, Alice Gothard McClary; son David McClary; nieces Andrea Burton Dedman (Wayne), Kim Burton Cervantes, Carolyn Minton Brownell (Ralph), Barbara Minton, Sharon Minton Rhoad ; nephews Gary Burton and Richard “Dickie” Burton, Jim McClary, Bill McClary. Also survived by numerous other nieces and nephews. A proud graduate of Central High School class of 1946, he was class president and captain of the football team in addition to being on the basketball and baseball teams. Mr. McClary served in the U.S. Navy in the early 1950’s. Mr. McClary was a vice president in various facets of operations at Commerce Union Bank (now Bank of America), serving there for some 48 years. A devoted husband to Alice and father of Sam and David, he always placed his love and care for them above all else. He was also a life-long member of the Methodist Church and a member of West End United Methodist Church since the early 1970’s. He was a gregarious and kind man, known for his sense of humor, love of history, good conversation, and for his genuine interest in people and the world in general. A Celebration of Life Service will be held 1:00 p.m. on Wednesday, February 13, 2019 at West End United Methodist Church, 2200 West End Ave., Nashville, TN with Rev’ Brandon Baxter officiating. Pallbearers include: Gary Burton, Dickie Burton, Wayne Dedmon, Pat Simpson. Visitation with the family will be held at 11:00 a.m. – 1:00 p.m. on Wednesday prior to the service at West End United Methodist Church. In lieu of flowers, contributions may be made to West End United Methodist Church or the American Heart Association. We sure did love Mr. Red. We met him at Heartland in the dining room. He loved to sing for sure. He would come and visit my mom and dad at their table every day. They always had a good time singing an old song together. He will greatly be missed. So sorry for your loss. My father lived with Red prior to his passing at McKendree. Not many people could live in the same room with my dad…he wasn’t easy, but Red was a shining light. He kept my dad fighting with his own fighting spirit, and he kept our spirits up as well with his enthusiasm for all things living. He touched my family, and I have thought of him so, so very often in the time since my dad’s passing. They are sharing more WWII stories together now. God bless your family. My heart aches for your loss. Vicki, I’m so touched by your sentiment. It means so much to me. Thank you again for your beautiful words, Vicki. Mr. Red will definitely be missed. I met him at Heartland while visiting with a family member. He was such a joy to see in the dining room taking care of his wife. He would always come over and sing a song. He had a way of making you smile on even the worst of days. I am so sorry for your loss of such a beautiful person. I worked for Mr “Red” McClary at Commerce Union Bank many years ago in the Data Processing department. It was with great sorrow that I read of the passing of this great man. My condolences to his family and many friends. He will be missed. I knew Red for many years when he would work out at the St.Thomas Wellness Center early in the morning. He was a big UT football fan and would often buy my tickets when I could not go to the game. He and L.D. Hbobs became my good friends during those years. My prayers are with his family. We hope all your happy memories of Wallace will ease your loss and bring you comfort. Miss visiting with you. Thank you, Joe and Norma! I was acquainted with Red and Alice both through West End U.M.C. and by long deceased mutual friends Peggy and Joe Cambron. He was always a gentleman. And I can remember his concern for the Cambron family when Peggy died suddenly in 1990.